Browser's Magic Bash 2019 - OFFICIALLY SOLD OUT! 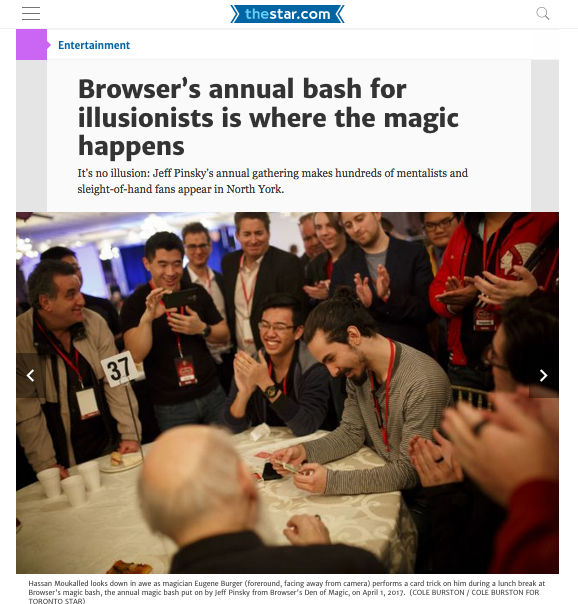 The Toronto Star covered our Browser's Den Magic Bash. On the first Saturday of each month here at 'Browser's Den' we have a Magic Club that meets from 2:30pm until 5:00pm. Whether you have been interested in magic for two months or twenty years all are invited to attend. At the club magicians and hobbyists sit around our 'magic' table and talk magic and show each other tricks. Plus cookies and snacks are provided. Hope to see you at the next one! Yours very truly - Jeff Pinsky, Jeff Hinchliffe, Lisa Close & John Cardella.